Despite this weekend's cold front, we didn't feel much relief at all, because it retreated back to the north as a warm front. We continue with the warmth and the humidity through most of the week. Today and Tonight: Your Monday will bring partly sunny skies. Isolated showers and thunderstorms are possible, but widespread and heavy action similar to Saturday is not expected. The best chance for rain will come in Southwest Mississippi. Within the 13 Parish, 3 County forecast area, 30 percent will pick up measurable rain. High temperatures will climb into the low 80s with south winds of 5-15mph. Overnight, look for partly cloudy skies and lows in the mid 60s. Up Next: While a shower can’t be ruled out, partly sunny skies are expected Tuesday and Wednesday. 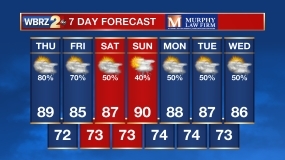 By Thursday, a cold front is expected to pass through the area. We will be monitoring this time period for another chance of strong to severe storms and possibly heavy rain as well. Once again, temperatures will not drop very much behind the front. The air will feel slightly drier, but don't expect a big cool down. We are getting closer and closer to that Louisiana heat! THE SCIENCE: An upper level short wave trough will traverse the Mid-Mississippi River Valley today bringing isolated convection to the forecast area. The best dynamics and support will reside north of the local area. As a result, the best chance for showers and thunderstorms will be across Southwest Mississippi and adjacent parishes of Southeast Louisiana with decreasing chances farther to the south. Even across our northern areas, POPs will be kept in the 30 to 40 percent range. An isolated strong storm or two cannot be ruled out across the far northern reaches of the area where SPC has a marginal risk for severe weather. The main threats in these areas would be damaging winds and hail. A few showers and storms could linger into the evening hours across the far northern sections of the forecast area. Otherwise, quiet conditions will prevail tonight with some fog development expected after midnight that will persist through early Tuesday. Upper level ridging over the Gulf Coast states will bring warm and mainly dry conditions through Wednesday. The threat for convection will begin to increase from the west Wednesday Night and continue through Thursday Night as a potent upper low/trough moving out of the Southern Plains Wednesday translates eastward across the lower and Mid-Mississippi Valley Thursday and Thursday night. This system will have the potential to produce some strong to severe thunderstorms across the area along with locally heavy rainfall Thursday and Thursday Night before shifting off to the east. The SPC has already highlighted the entire WBRZ Weather forecast area with a 15% chance for severe weather. A quiet period will commence on Friday and continue into Saturday as upper level ridging builds back over the south ahead of yet another strong system that will impact our weather for the latter half of the weekend and into the beginning of the following work week. There are still some differences between the models with the strength, evolution and timing of this system, but at this time it appears that the path of this vigorous system will be farther south than its predecessor and will move across the Lower Mississippi Valley during the aforementioned time period. This system is still seven to eight days out, but there appears to be some potential for a severe weather and possibly heavy rainfall threat with it.